Will Clary Fray live to fight another day? Has the Shadowhunters TV show been cancelled or renewed for a fourth season on Freeform? The television vulture is watching all the latest cancellation and renewal news, so this page is the place to track the status of Shadowhunters, season four. Bookmark it, or subscribe for the latest updates. Remember, the television vulture is watching your shows. Are you? A Freeform supernatural drama based on The Mortal Instruments book series by Cassandra Clare, Shadowhunters stars Katherine McNamara, Dominic Sherwood, Alberto Rosende, Emeraude Toubia, Matthew Daddario, Isaiah Mustafa, Alisha Wainwright, and Harry Shum Jr. 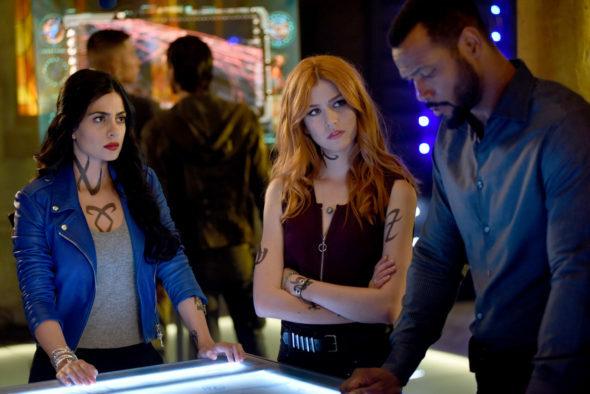 The series centers on Clary Fray (McNamara) who, upon turning 18, learned she is from a long line of demon hunters called “Shadowhunters.” In season three, the Shadowhunters and Downworlders try return to normal, in the wake of Valentine’s death, but everyone is keeping secrets, which never ends well. The third season of Shadowhunters is averaging a 0.14 rating in the 18-49 demographic with 371,000 viewers. Compared to season two, that’s down by 47% and 43%, respectively. Learn how Shadowhunters stacks up against the other Freeform TV shows. Shadowhunters is ending with season three. The series finale airs May 6, 2019. Could it be revived someday? Stay tuned for further updates. Will Freeform cancel or renew Shadowhunters for season four? The ratings are way down so things don’t look good. For now, I’ll keep an eye on the ratings and update this page with breaking developments. Subscribe for free Shadowhunters cancellation or renewal alerts. 6/4/18 update: Freeform has announced that season three will end the Shadowhunters series. Details here. TV show ratings are still important. Follow Shadowhunters‘ weekly ups and downs. Find more Shadowhunters TV series news or other Freeform TV show news. What do you think? Were you hoping that the Shadowhunters TV show would be renewed for a fourth season? Are you sorry that Freeform is ending this series? I just saw “Claire” as a guest star on Arrow, so that prompted me to search about a Season 4 renewal and saw it wasn’t renewed after the 2nd half of the current season. Yes please bring it back. I love this show at least do a proper ending. There’s to many questions left unanswered. Is Alex die, is clary alive, please bring it back for at least one more season to answer these questions. Season 3 is not over yet. The midseason return is 2/25. It’s just not renewed after this season. WHY do they kill off the best shows and leave all the other crap, and wonder why they loose viewers and the there ratings, life is bad enough and the world is getting worse everyday, PLEASE leave something decent to watch and enjoy. LEAVE SHADOWHUNTERS ALONE. I am so sad this show is ending. I always looked forward to watching. Please don’t cancel. This has literally been the best tv series that I’ve ever watched! I looked forward to it every week! I really hope they make more of this amazing series! I loved the books and was delighted to see the series on cable but was totally unaware of it’s existence so perhaps it’s demise was due to lack of advertising in the face of more well advertised shows. I will miss it not returning since I only got to view it in the summer of 2018. I looked for it and see programs that are repeating that really have the moths flying. I think that the only reason why the season 3 has lower rating it’s because everyone no matter what try to help clary and jais by giving even their lives and they just keep on beeing stupid, like what the **** Clary? you gave up to an angels wish for Jeis? Why not end the war? or the world hunger? REALLY! I think the show should be renew.. It should be given a chance.. It is a good show and very enjoyable.. I’m very discourage that because of one low rating season you choose to cancel.